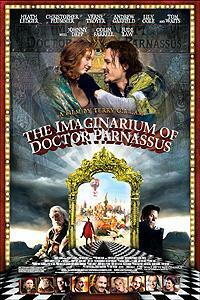 "The Imaginarium of Doctor Parnassus" is a fantastical morality tale, set in the present-day. It tells the story of Dr. Parnassus and his 'Imaginarium', a traveling show where members of the audience get opportunity to choose between light and joy or darkness and gloom. Blessed with the extraordinary gift of guiding the imaginations of others, Doctor Parnassus is cursed with a dark secret. An inveterate gambler, thousands of years ago he made a bet with the devil, Mr. Nick, in which he won immortality. Centuries later, on meeting his one true love, Dr. Parnassus made another deal with the devil, trading his immortality for youth, on condition that when his daughter reached her 16th birthday, she would become the property of Mr Nick.